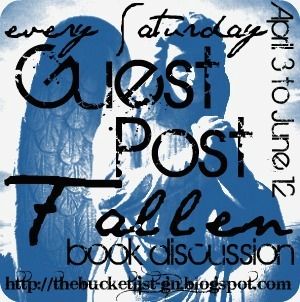 Guest Post by Erin W.
Hello to the book blogging world! 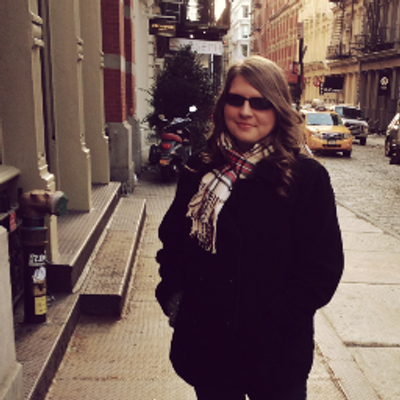 My name is Erin and I’m the book-crazy girl blogger from Tales of the Inner Book Fanatic! I’m so honored to be a part of this event and I’m also very excited to share a little bit of my love for Lauren Kate’s Fallen series! For today’s guest post, I’m going to be focusing on the music side of things and share with you some of my favourite songs, and ones that remind me so much of the Fallen’s characters - more so with Daniel and Luce! Now I don’t know about you guys but whenever I read a book series – especially some of my favourite book series – I always listen to songs on my iPod and so very often I come across songs that I instantly compare them to a certain book of mine and in this case here are my top 5 songs for Fallen. This song is such a beautiful one and everything about it reminds me of Luce and Daniel's relationship. Mostly the sweetness of their relationship that we see from time to time in the book series. I just adore this song so, so much. Within Temptation has so many songs reminding me of the Fallen book series but this is my personal favourite of all favourites. This song not only reminds me of Luce and Daniel's relationship, but personally for me it mostly reminds me of all the struggles and all the dangers they have faced and are still facing, and the frustration that comes along with it! Whether it's the U2 version or this one in particular, which is just as awesome as the original, but whenever I listen to this song and the lyrics in it, I always picture Daniel in my head. It just seems like his type of song and how he's scared of losing his soul mate, and the song sort of expresses those feelings of his and how he couldn't live without our Luce! I'm a huge Flyleaf fan and this song without a doubt is a Luce song. She always fears for Daniel's safety - like he does for her own safety - and how he constantly puts himself on the line to save her life . . . so I find that this song in particular is almost too perfect to mirror those fears of hers! Fireflight is yet another favourite band of mine and this song is one I immediately thought of when I thought of the Fallen book series. And for me it's another Luce song! Luce has faced so many things from books one to three - not the mention so many consequences for her actions - and by now she has grown so much, and I find that this song is perfect in describing Luce and how she's finally realizing that she has the strength and the courage to fight for what she loves and believes in, and succeeding with that mere determination! So what other songs remind you of Fallen? Thanks for stopping by and reading my guest post! Thank you so much for joining us today, Erin. You definitely want more of her writing. You need to check her out HERE.